Why am I bringing this up now? As we near the May 3 release of Guardians Rising, I think it'd be interesting to look at the Japanese meta and see how some of the new cards may impact the rest of the world. 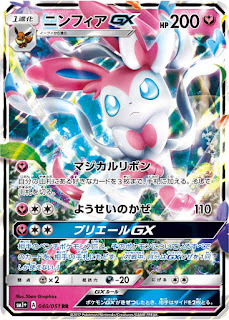 Obviously the decks in this post aren't that useful for crafting decklists outside of Japan, considering the wacky format, but they will let the rest of us see how cards like Drampa and Sylveon are being used, giving us insight into their competitive potential over a month before they're legal overseas. There's also the added benefit of having a little knowledge of those crazy Japanese decks should you run into a player from Japan at an Internationals or even the World Championships. I'll look at some of these concepts in more detail later. For now, let's dive into those decklists. Because some of them are just ridiculous. 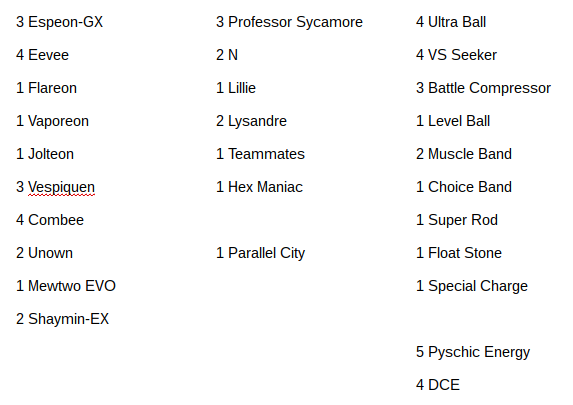 I'll take some notes on all the Top 8 lists; for the rest, I'll just present the lists. One man can only do so much work. Dragon Rayquaza-EX??? Why??? Since this deck only plays DCE and Metal Energy, it can only use this card's first attack, which does 30 damage for a DCE. The only advantage this card has over its colorless counterpart is 10 more HP. I'm really not sure why there's a 2-2 split here - but there must be some reason. I assume the higher HP is actually fairly useful, and the attack can finish off a KO in rare circumstances, like when you hit for 210 and then Sky Return. Also unusual is the diversity of Supporters. There are only 2 Sycamore and 1 N! (1 Lillie as well, but that's still only 4 draw supporters!) 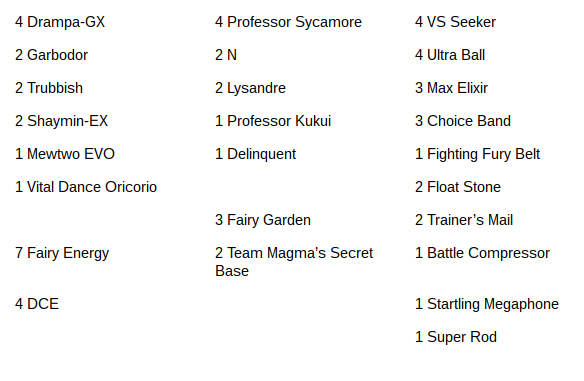 I know there's max Shaymin in this deck, but I don't think I've seen Ray ever running less than 4 Sycamore. I've noticed that Japanese decks tend to sacrifice speed and consistency in exchange for techs - the decks are built to combat the entire meta and not accept autolosses. The Supporter line here supports that (haha): there are 9 (!) 1-ofs, including Delinquent, something else I've never seen in a Ray deck. Sudowoodo, which has an Ability limiting the opponent's Bench to 4 Pokemon, is a great tech against the mirror. Even the long-invincible Yveltal-EX has been struggling a bit with the power creep - it's often unable to keep up with the likes of Mega Ray, Volcanion, and Turbo Dark. 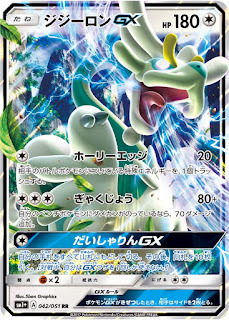 Drampa-GX gives it the extra oomph it'll need to compete in this format. Drampa is an extremely solid attacker that can deal 150 for three Colorless Energy (180 with Choice Band). 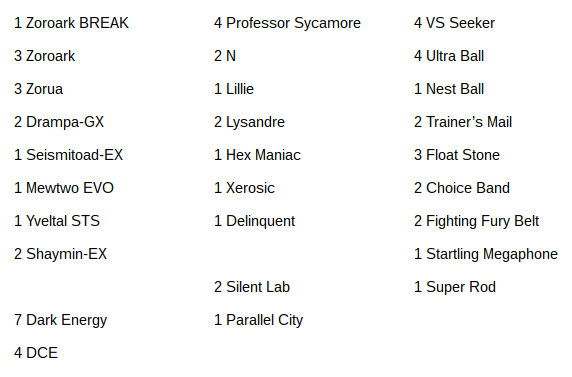 In combination with Tauros-GX and, of course, Yveltal-EX, Drampa offers Yveltal decks a toolbox of attackers to work with, all in a streamlined DCE-attacking, Basic Pokemon, heavy-duty package. I'm interested by the fact that this list excludes Ninja Boy. One of my favorite plays in Yveltal decks is to Ninja Boy a damaged Yveltal into a Tauros-GX and use Mad Bull. Without Ninja Boy, it becomes just a little bit clunkier to switch between attackers. I suppose the 3 Float Stone and Olympia help with that, but if I wanted a Ninja Boy-less Yveltal build, I'd stick with Azul Griego's Tauros-less model. Another thing excluded here is Fright Night Yveltal. 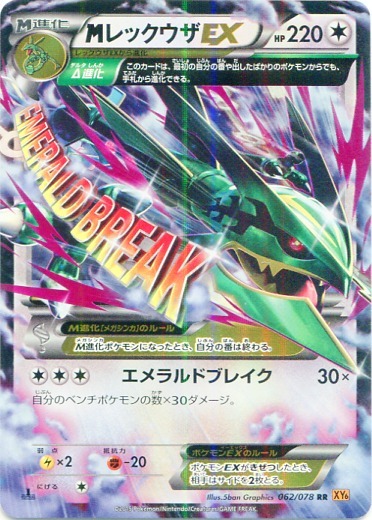 That's pretty much a staple for Yveltal decks in our format, but I think I know why it's not in the Japanese list: Japan's XY-on format means tool removal like Startling Megaphone and Xerosic (used in this list) are available, and therefore the Ability to prevent tools from working is not nearly as good as it is in our format. 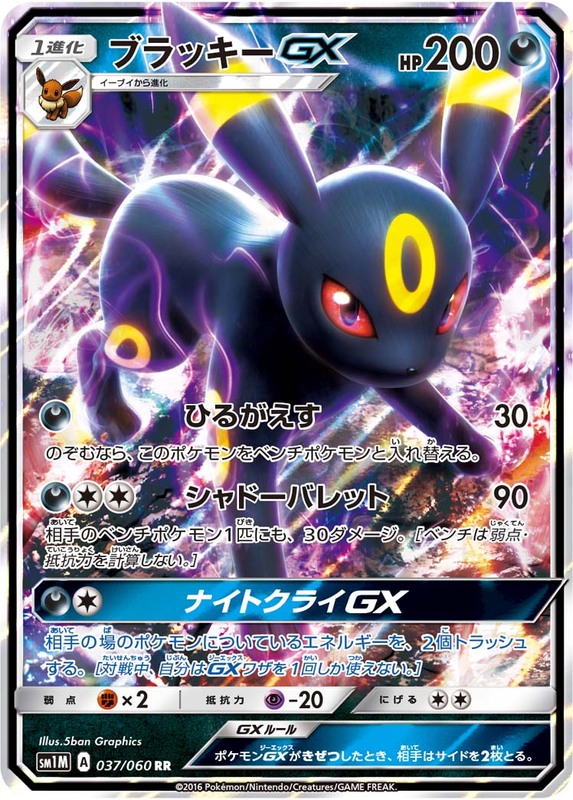 I guess this is more of a Zoroark deck than anything else, but Umbreon-GX and Zoroark are both solid attackers that turn into KO-ing machines when they can hit for Weakness - which is what the other Eeveelutions are there for. Those Eeveelutions have other benefits too: a Jolteon or Vaporeon allows you to make use of Rough Seas, which is super creative: healing 30 per turn from your Zoroark BREAK or Umbreon-GX can be clutch if you're able to successfully switch between your attackers. I would be worried about the lack of switching cards here, now that I think about it; maybe a second Float Stone or an Escape Rope in place of a Lysandre would work better. Damn, Xerosic looks like it's basically a staple in Japan - which makes sense, given how much of a nuisance you can be when you use it to discard Float Stones, Fury Belts, and Spirit Links. 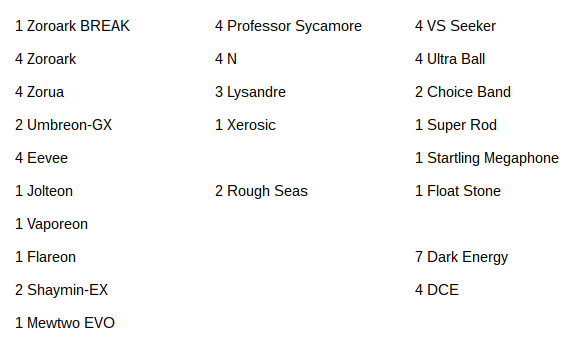 But this deck actually opted for the 1-1 Megaphone/Xerosic split, which is interesting. At first I thought Mewtwo EVO would've been mostly useless because not a single M Mewtwo made Top 16 at Osaka, but upon closer inspection, there are other Psychic-types to worry about. Mewtwo can be an answer against Lunala-GX and Espeon-GX, so perhaps its inclusion here is worthy after all. 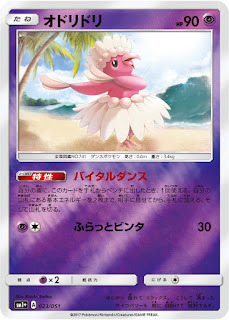 Oricorio, specifically the Pyschic-type Pa'u Style, has the Vital Dance Ability, which acts as a Professor's Letter when you Bench it. 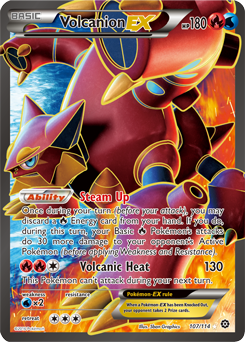 This is certainly useful in a variety of decks, notably Volcanion, because it's easier to search for a Pokemon than an Item. It's probably used in this list to ensure you always have a backup Energy for when you use Max Potion. ...one of the AZ. 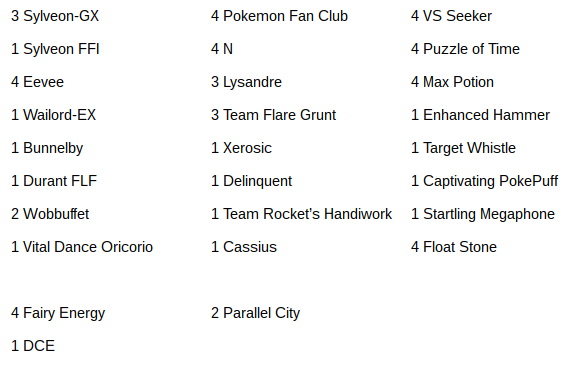 It doesn't make sense to me why a deck that can discard its Benched Pokemon at will would play 2 AZ. One makes sense, because if you get Lysandred and stuck active under Item lock, you can't use Escape Rope, but two seems a bit much. Another Supporter I don't get: why Pokemon Ranger? 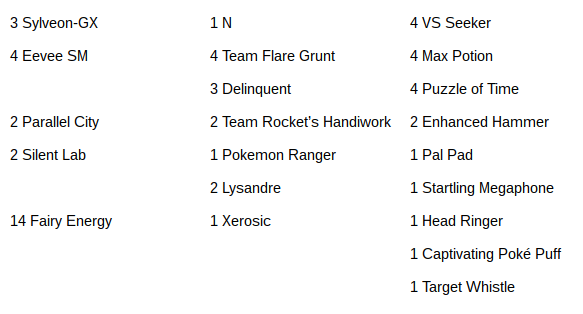 It doesn't seem like Glaceon-EX and Regice are very prominent in this metagame - certainly not in Top 16 - and Gardevoir should wreck Giratina-EX, so maybe this was just a bad meta call and the player was expecting more Glaceon and Regice than actually showed up. 4 TEAM FLARE GRUNT?! 3 DELINQUENT? You don't need to play draw Supporters in Sylveon, so you can afford to Flare Grunt or Delinquent every turn. This deck must be disgusting to play against. Pal Pad, the worst Item card of all time, is in this deck for some reason, because why not use Team Flare Grunt 4 times when you can use it 6 times. Or 10 times, if you use all your Puzzles to get back Flare Grunts. This deck is a meme. If you weren't sobbing yet, there's also Xerosic, Megaphone, Poke-Puff, Target Whistle, Head Ringer, Silent Lab, Parallel City, and 4 Max Potion. So this deck is essentially your worst nightmare. I actually have no idea how anything beats it, since there isn't a reliable Steel option at the moment (at least until Volcanion dies out). God Bless Japan. Sylveon is a perfect example of the slow, disruptive, agonizing nature of the Japanese metagame. They seem to love decks like Sylveon and Toad/Owls that wear down the opponent rather than going in guns blazing. It does seem to indicate that our format is - thankfully - going to slow down as well in the Sun and Moon era. However, it's telling that a speed deck - M Rayquaza - wound up winning Osaka anyway. Now that I think about it, Ray actually has a pretty good Sylveon matchup. That Delinquent in the first-place list makes sense now: it's a way to combat the Silent Labs and Parallel Cities in Sylveon decks! Now that is metagaming. Chris Taporco was right! The Some1sPC member's original thoughts on Espeon-GX were that it belonged with Vespiquen, a view that drew laughs from Russ LaParre and the rest of Team PC. But, at least in Japan, "Vespeon" is apparently thriving. 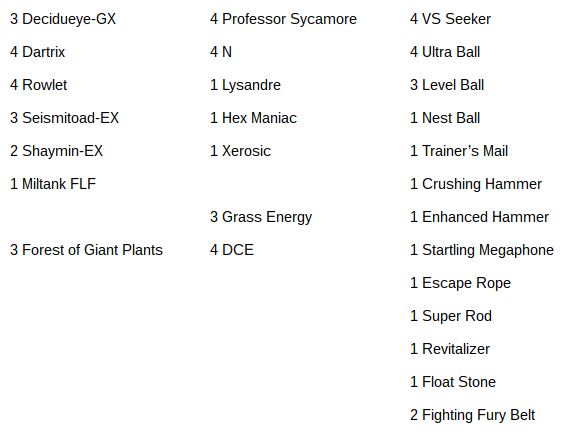 This is a pretty weird Vespi list though; in fact it's really an Espeon list with Vespiquen tech. 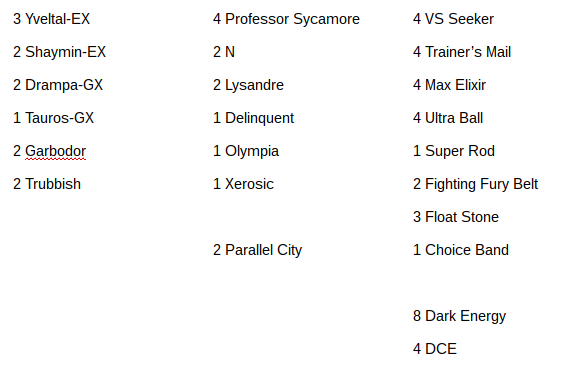 There are only 22 Pokemon, meaning a Vespiquen can't deal as much damage as easily as in traditional Vespiquen decks. But Japan does have Choice Band and Muscle Band in format, a fact which has been taken full advantage of in this list. I've never seen Teammates in a Vespiquen deck but it does make sense here - rather than Revitalizer, which limits you to grabbing Grass-types, you can grab something like an Eevee and an Energy to pull off a surprise Espeon, or perhaps a surprise type-change Eeveelution, a DCE out of nowhere for a Divide GX, a Band or Compressor to boost damage, or all kinds of other interesting combos. I like the concept but I don't really like this list. It seems inconsistent with 1 Level Ball, 2 Shaymin, and 2 Unown, plus only 1 Special Charge. It also seems destined to lose Stadium wars. But I guess it did well at Osaka, so who am I to judge? With the release of Drampa-GX, Yveltal decks have transitioned from Yveltal/Tauros to what might best be called "Yveltal Toolbox." In fact, I'm surprised I haven't seen any "Yveltal PlumeBox" lists out of Japan yet... 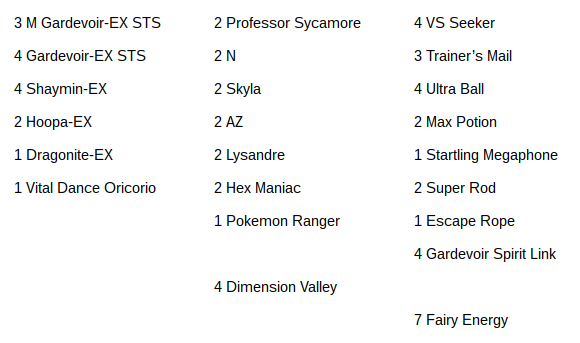 This list plays 2 each of Yveltal-EX, Tauros-GX, and Drampa-GX, as well as a Ninja Boy, so it's able to pick the best attacker for any situation. Oblivion Wing Yveltal (STS) was chosen here over Fright Night Yveltal (BRT). I pointed out earlier that Japan doesn't really need Fright Night since it has Xerosic and Startling Megaphone, but this list doesn't play either of those, which confuses me. I don't really see what purpose the baby Yveltal serves in this deck. 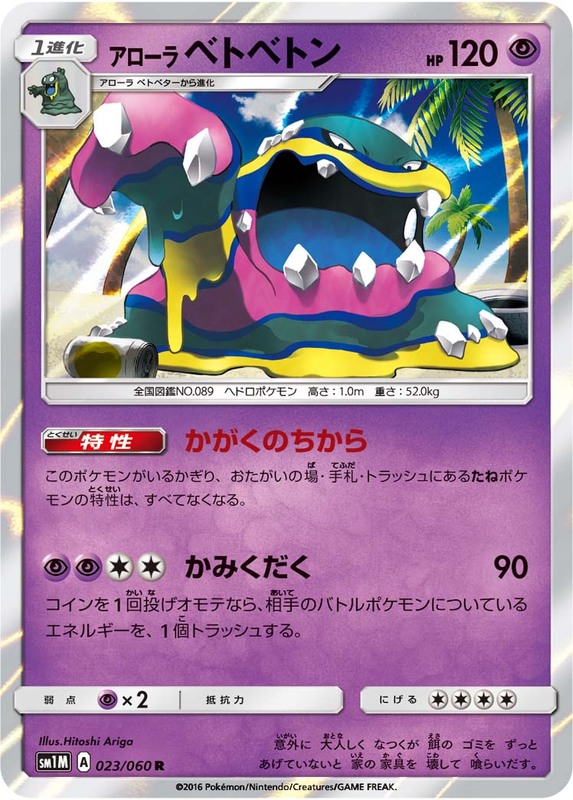 Likewise, I don't see why Alolan Muk was chosen over Garbodor. The big reason I can think of is that Megaphone or Xerosic can put a Garbodor out of action, while Muk doesn't have the Tool requirement. But Garbodor is just so much of a stronger card. 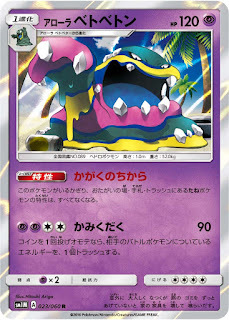 Muk is only optimal when paired with Vileplume or Trevenant, because you can still use your evolutions' Abilities. I don't know why Muk was chosen here; its benefits (no Tool needed; higher HP) don't at all seem to outweigh its drawbacks. 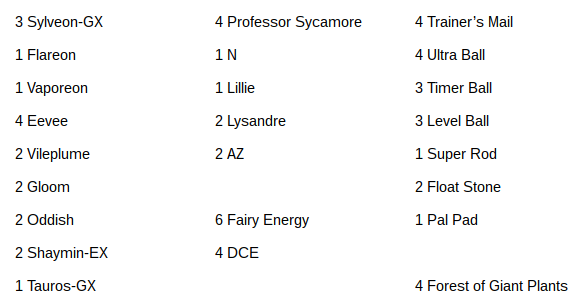 Some minor interesting card choices to note: 2 Lillie, which makes for a really thick draw Supporter line. I assume this was done to avoid benching Shaymin for easy Prizes. 8 Dark Energy is less than the minimum (9) I'm comfortable with in a Max Elixir deck. It seems like you'd whiff half your Elixirs, especially without deck thinning like Battle Compressor. I do love the Sudowoodo here to help with the Ray matchup. Lastly, Altar of the Moone was chosen here over the typical Parallel City or Reverse Valley, which is interesting because Yveltal already has tons of retreat options via Float Stone and Olympia. 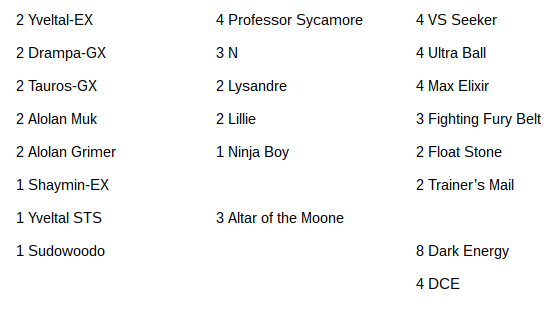 I don't think Altar of the Moone is the optimal Stadium in this deck because it does things other cards can already do, while Parallel or R-Valley have a unique effect. Now this is a deck I can get behind. Drampa can do 180 for three Colorless Energy if the right requirements are met (Choice Band and a damaged Benched Pokemon). This deck has the ability - via Magma Base - to damage its own Pokemon and boost Drampa's output. Drampa is a very versatile - and very good - card, as we've seen from its inclusion in the two Top 8 Yveltal decks; its first move deals 20 for [C] and discards a Special Energy attached to the Defending Pokemon, while its GX move is an absurd shuffle-and-draw-10. This moveset, combined with Garbodor, a little disruption, and Fairy Garden, makes for a fun and versatile, yet simple, deck. I like. There is at least one weird Japanese thing going on here though: 3 Max Elixir with 7 Basic Energy. I don't know how I feel about that. But at least there's Compressor to thin the deck a bit. Mewtwo EVO appears to be a big tech in the Japanese meta, and it either worked tremendously well or failed horribly, because there's no Mewtwo in this Top 16. 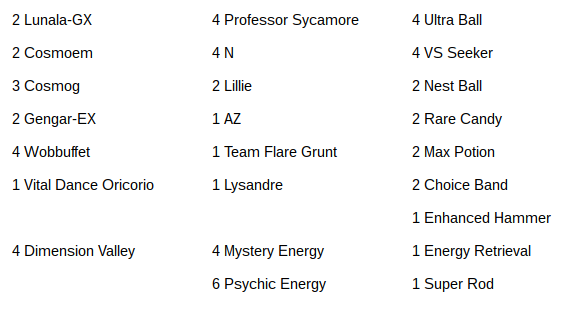 Oricorio makes its second appearance in this Top 16; we previously saw it with M Gardevoir. That Ability is certainly useful, but this is a Garbodor deck, so you've limited yourself to only using Oricorio when you don't have Garbodor out - ideally, on turn 1. 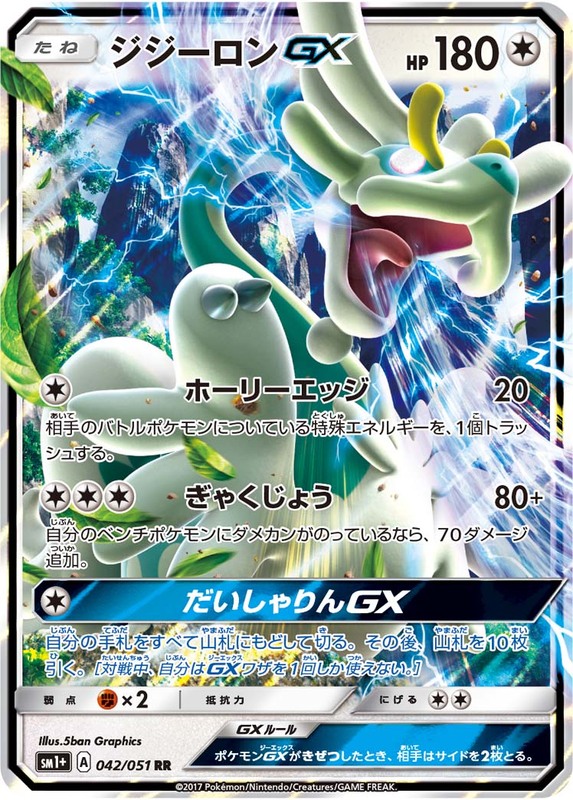 And on turn 1, you don't want basic Energy in your hand - you want them in your deck so you can use Max Elixir and charge up a Drampa in one turn! I have to say I'm really confused about Oricorio's inclusion in this deck. 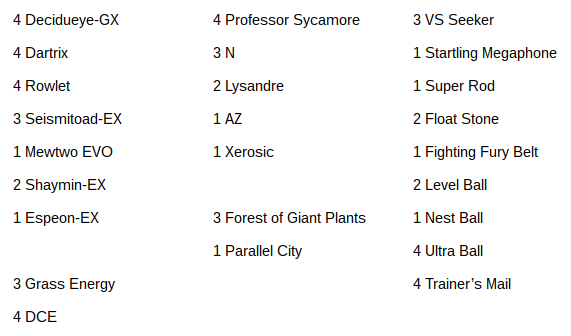 This is a pretty straightforward Volcanion list; the main changes are the low count of Float Stone, which I think was done to fit a thicker Supporter line -- in addition to Blacksmith, Japan's XY-on format has access to Xerosic and AZ. 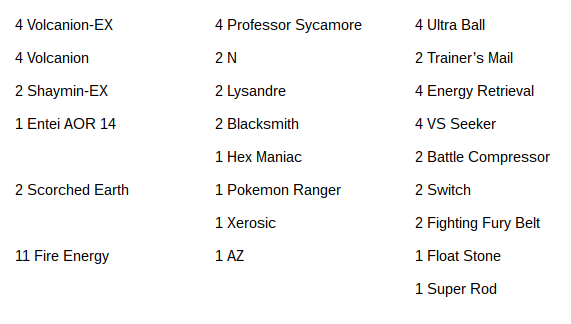 Hex Maniac is presumably good in several matchups, including the mirror, but we don't often see it in our Volcanion lists. 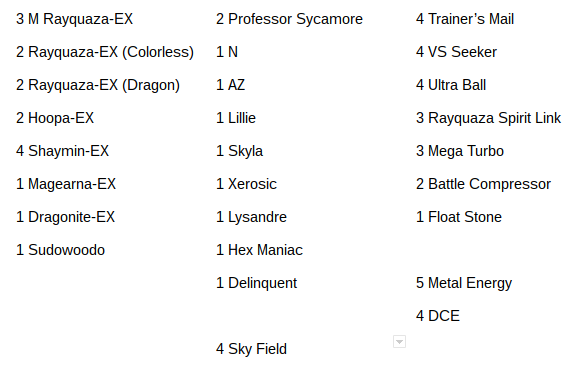 This list chooses to play Scorched Earth over Sky Field, a move backed up by the fact that the deck doesn't play Hoopa-EX. My guess is the availability of Blacksmith lets Japanese players cut out some aggro/consistency cards and add in a few more techs. The backup attacker is Entei AOR 14, which is usually chosen because it helps against M Rayquaza and gives up only one Prize (unlike the other common Volcanion backup, Salamence-EX). 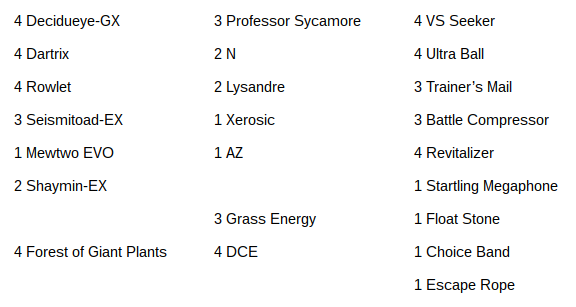 Were there any more of the top sixteen deck lists? do you have the right garbodor in mind for some of these comments? Did Trashalanche do much? Cheers! Why there is no single Tapu Lele GX in these decks?